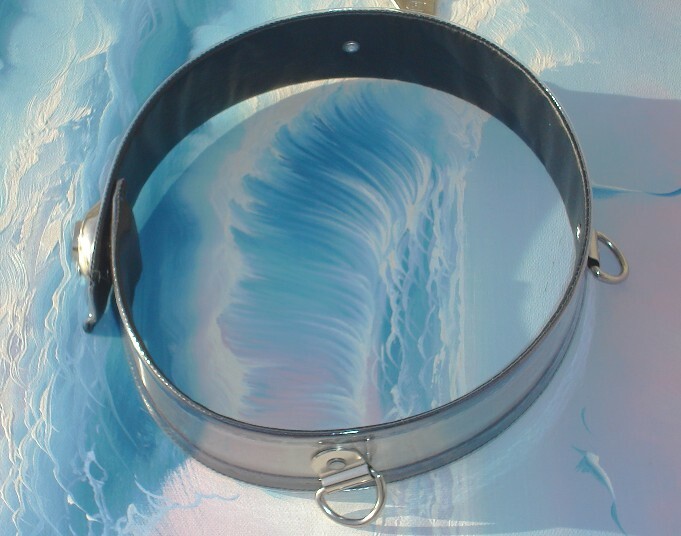 Our stainless steel collars are made from 24 ga. by 1 1/2" wide stainless steel. They are covered with a clear vinyl in the front, and black vinyl backing. They have their own unique built on locking system which can not be picked by even the best of experts. There are 3 D-rings on the collar. If you choose to purchase chastity belts, cuffs, or thigh bands, you can have all items keyed alike. All items will be custom made to fit you perfectly. After placing your order, we will need you to measure the circumference around your neck, than email us back with the results.